Harman's upped its audio game at the 2014 IFA tradeshow with its new Harmon Kardon Omni speaker system. The firm's touting its new wares at the first wireless HD multi-room system, capable of beaming music between rooms 'at the touch of a button'. The new system is launching with three different products. There's two new loudspeakers, the Omni 10 & 20, and the HK Adapt, which plugs in to your existing speaker system for a quickie wireless upgrade. The Omni 10 or 20 can be used as standalone speakers, or you can dot them about your house and play DJ in every room at once. Harman says you can set up two speakers for stereo output, or even stick five about the place for a full multi-channel speaker service. All three devices work in sync with the Harman Kardon app, which lets you stream music straight from your smartphone. The other advantage of pairing is One Touch Follow Me Audio mode, which has your music follow you between rooms with a button-press. "The Harman Kardon Wireless high definition audio system represents the ultimate in scalability, upgradeability, and personalistation for home audio entertainment," gushes Michael Mauser, Harman's Lifestyle Division don. "And you shouldn't have to sacrifice great sound of beautiful, forward-lookign design in order to get it. Our Omni loudspeaker systems and Adapt wireless adapter make this happen, without compromises in sound quality or aesthetics." 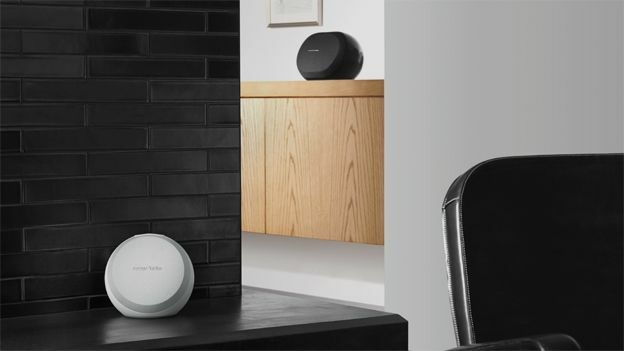 Users can connect up to the speaker system via Wi-Fi and Bluetooth, with Harman promising to push regular updates over your network to 'future-proof' its wares. All three devices will go on sale in mid October, with the Omni 10 pricing up at £159.99, the Omni 20 at a heftier £249.99, and the Adapt module retailing for £99.99. The Japanese audio giant is teasing the audiophiles with new High Resolution Audio equipment at next week's show.